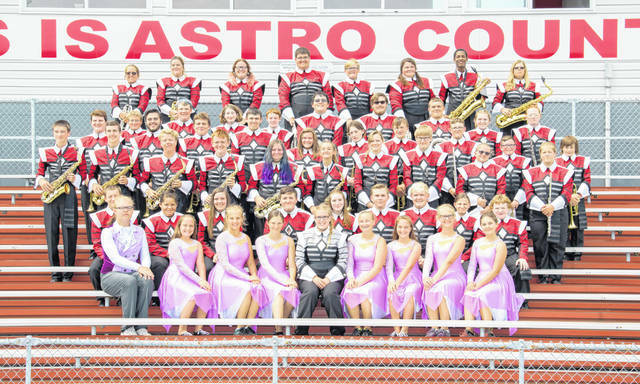 The East Clinton High School marching band, from left to right, front row, Austin Reedy, Haley Harrington, Astasia Fair, Arionna Fair, Cheyenne Berry, Tessa Bosier, Emily Harrington, Jaiden Alloy, Autumn Smith; second row, Braiden Rosenwirth, Hailey Luster, Destiny Conroy, Logan Kaiser-Browning, Josephine Morgan, Caleb Morton, Ethan Reedy, Katy Roehrich, Kittrick Adams; third row, Zack Vaughn, Clayton Harrington, Hayden Davis, Teddy Murphy, Ashleigh McKnight, Brooklyn Hamilton, Jazmin Carrico, Caden Morton, Kayeligh Lewis, Autumn Berry; fourth row, Zane Everhart, Aaron Hughes, Joshua George, Titan Thompson, Samantha Kraner, Tanner Fooce, Jayden Brown, William Woods, Seth Rowley, Tanner Fooce; fifth row, Dakota Pierson, Dawson Perry, Paige Fetters, Kyle Roth, Noah Pattan, Grant Wisecup, Preston Pauley, Alexandria Hughes, Miranda Pierson; back row, Crystal Hargrave, Samantha Estep, Lindsay Koch, Elijah George, Shane Lynch, Alexandria Turner, Shmar Hyman, Emily Berry. Band members Lydia Denny, Eleina Tillman, Bethany Piatt, Izabelle Piatt, Austin Hodson, Owyn Fleak, Isaiah Rowe and Reese Morgan were not present for the photo. The program will take audiences on the emotional journey of young fairies taking flight for the first time from their first steps to getting their wings and a celebration of learning to fly. Each movement will present a different moment in their story as they experience the joys and challenges of their life. In the end all they want to do is fly. This year’s production features wind arrangements by Jair Klarfeld, percussion arrangements by Alan Miller and drill design by Kendra Wendeln. Musical selections include “Cloud 9” by Jair Klarfeld, “With Heart and Voice” by David Gillingham, and “Fly to Paradise” by Eric Whitacre. In addition to performing and supporting the football team, school and community at football games throughout the fall, the band will perform at various community parades and in competition at the local, regional and national level. Samuel Minge is the EC band director with Laura Nichols as the assistant director. Grace Hubbard is the color guard director and Tyler Ludwick is the percussion director. Patrick Neanover is the visual instructor. The summer instructional, volunteer and design staff includes Drew Theising, Gavin Newton, Lindsey Tolle, Xavier McKinney, Brandon Vaughn, Ryan Aubin, Alex Mitchell and Erica Snodgress. The Astros marching band drum major is Cheyenne Berry.